Adcraft's gear driven 10 qt. 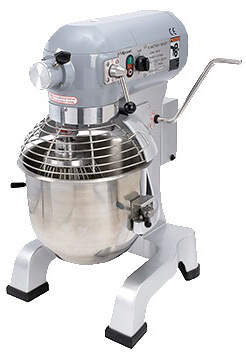 commercial planetary mixer is perfect for any small bakery, restaurant, deli and more. It's heavy duty construction and powerful 0.75 HP motor will easily handle any type of mixing task needed with ease. Three fixed speeds and its direct drive 100% gear driven transmission allow the mixer to maintain a consistent mixing speed no matter how much product is in the mixing bowl. Comes complete with a stainless steel mixing bowl, wire whisk, dough hook and flat beater attachments. 120V, 600W, 0.75 HP. 5' long power cord with a NEMA 5-15 plug. This unit is ETL Listed and ETL Sanitation and backed by Adcraft's 1 year replace or repair warranty.